GOP Senator Sued Over Phone-Snatching Incident - Joe.My.God. 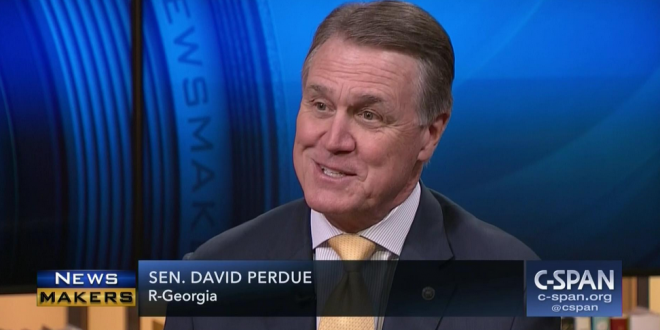 A Georgia Tech student, who recorded Sen. David Perdue (R-GA) snatching his cell phone out of his hand when he asked the senator a question about voter suppression, sued Perdue for battery on Monday. The student, Georgia Tech junior Nathan Knauf, alleges that Perdue committed unlawful battery when “he seized Mr. Knauf’s phone, touching Mr. Knauf in the process of seizing the phone, while angrily declaring: ‘No, I’m not doing that — I’m not doing that,’” according to a copy of the complaint shared with TPM.